Travelling with Komodo Liveaboard during the Rain: Is It Possible? Labuan Bajo raise into fame in fairly quickly, and now travelers from all corner of the world starts looking for available Komodo Liveaboard to start their adventure. The tropical frontier get especially packed during summer—or dry season, according to tropical climate system—when the sun is the hottest and the sky brightest. Generally, the climate in eastern part of Indonesia receive the less of precipitation than the western part. That means the monsoon season in Labuan Bajo is generally shorter and not as hard. This raise a big question: can you go on an Komodo liveaboard adventure during the monsoon season? Should you really wait until summer to hop into Labuan Bajo? Well, we do understand that not all people are lucky to get their summer leave approved. Some need to choose the shoulder season to get their well-deserved holiday, and here’s how you can maximize the chance. Hanging in the eastern tip of Indonesian archipelago, Labuan Bajo is blessed with good weather for most of the year. The monsoon season usually last between November to March, with January being the peak of the rain. If you compare it to western region like Java, Flores has still the fewer rainfall, with some areas experiencing less than 1.000 mm rainfall per year. That means even when Bali might be pouring wet by the rain, Flores might only have few hours of rain for all day long. Whether you want to avoid the overflowing tourist during summer or simply want to avoid the winter snow, November is your best bet before the rain start pouring harder in the middle of December. Sometimes it’s only raining once in a week, which is great to wet the land and prevent accidental fire. If you are a diver, this is the last best time to see sharks and manta. They are abundant in this time! Many dive sites become unaccessible during December to March due to the strong north-western winds. Many Komodo liveaboard are still operating during this time, but you better book it in advance before they close the last sailing. Some liveaboard operator in Labuan Bajo close their sailing trip in the end of November, and go to rest during December to February. Combination of heavy rain, strong winds, and rough waves make sailing dangerous. Nearing the end of March, some operators begin to open their service again as the sea is getting calmer. We highly recommend you to always communicate with your Komodo liveaboard operators to know their sailing schedule. Make sure the liveaboard prioritise your safety and not only after your money. 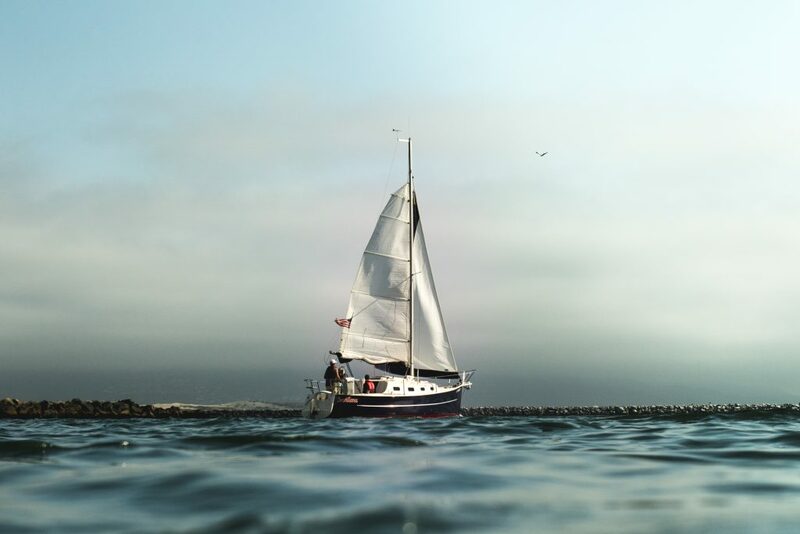 Trust the crew if they say they are not sailing—better reschedule the trip than having a bad day in the ocean. In conclusion, taking a trip to Komodo is still fairly doable, as long as it is taken with extra caution. Mild rain during the beginning and the end of rainy season is still safe—it can even be a welcome relief from the intense heat. Just avoid the peak of monsoon and always talk it beforehand with the boat operators.